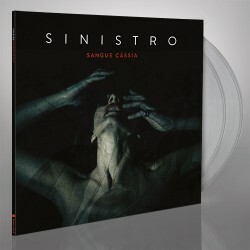 LP includes bonus tracks "Ferida" and PARADISE LOST cover "Nothing Sacred"
Portuguese doom (post-doom) quintet SINISTRO make a triumphal return with their beautifully wistful new album, 'Sangue Cassia'. Monolithic chords ring from the depths with the power of a funeral toll, while Patricia Andrade's gorgeous vocals dance among them elegantly. 'Sangue Cassia' is a modern doom classic in the making, and without a doubt SINISTRO's finest moment yet.